A massage that actually includes built-in nap time? Sounds too good to be true, I know ... but at YeloSpa, that's exactly what you'll get. The setup at YeloSpa is really what makes the spa stand apart from any other I've been to. Each treatment room, or YeloCab, is set up especially for the current treatment. When you arrive, you fill out a form that includes your light, sound and aromatherapy preferences, which are put on file and can be kept the same for future appointments or switched to your liking. (I, for example, love being massaged to the sound of the ocean.) Every massage therapist is unbelievable -- the pressure is just right, soothing you into a state of blissful oblivion. And the nap, oh, the nap! You're led into a separate treatment room for that part of the service, which includes the custom-designed YeloChair -- a thickly cushioned fine leather chair that reclines so your legs are elevated above your heart before the nap begins. As you drift off, your heart rate slows and produces a feeling of weightlessness -- all while you're covered in a luxurious cashmere blanket. Sound too good to be true? Trust me, it's not! 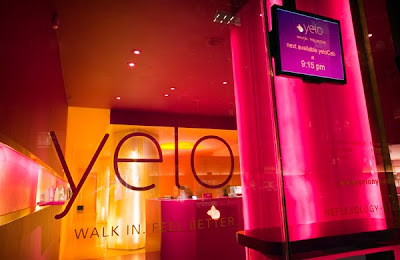 To book your own experience at YeloSpa, visit yelonyc.com. What is the speciality of Yelo Spa? Why it is different from others spa?